“The Holy Name of Krishna cleanses the mirror of the heart and extinguishes the fire of misery in the forest of birth and death. As the evening lotus blooms in the moon’s cooling rays, the heart begins to blossom in the nectar of the Name. And at last the soul awakens to its real inner treasure—a life of love with Krishna. Again and again tasting nectar, the soul dives and surfaces in the ever-increasing ocean of ecstatic joy. Sri Chaitanya Mahaprabhu is the pioneer of Sri Krishna sankirttana. He said, “I have come to inaugurate the chanting of the Holy Name of Krishna, and that Name will reach every nook and corner of the universe (prthivita ache yata nagaradi-grama sarvatra pracara haibe mora nama).“What is the meaning of sankirttana? Samyak means “full” and kirttana means “chanting.” Together, these two words form the word sankirttana which generally means “congregational chanting of the Holy Name of Krishna.” But samyak means full not only in quantity but also in quality. Full quantity means extensive in number: congregational. Full quality means complete praise. Complete praise can only mean the glorification of Krishna, and not any other gods. So sankirttana means complete kirttana, a song in praise of the complete whole, the Absolute Truth; anything else is only a partial representation and therefore defective to a certain extent. Therefore, Krishna should be praised. His glories should be chanted, for He is everything. He is the master, the dispenser of both good and bad, the Absolute Controller of everything. Everything is due to Him. The fulfillment of all life is reached in Him alone. Just as a horse may have reins to check his movements, but if let loose will run freely, praise which is unchecked by any mundane purpose will run straight towards the Supreme Cause, Krishna. The word sri means Laksmidevi: Krishna’s potency. This means that in sankirttana, Krishna is worshiped along with His potency, for Krishna’s potency is included within Him. Sri Chaitanya Mahaprabhu says that Sri Krishna sankirttana should thrive throughout the world; it should be victorious without any hindrance (param vijayate sri-krsna sankirtanam). It should be a spontaneous, unchecked, and natural flow. It should be exclusive, independent, and without reservation. And this praise of Krishna should be congregationally chanted—that vibration is beneficial for the whole world. Only by surrender and pure devotion can we take to Sri Krishna sankirttana. What are the different stages through which we will pass while chanting the Holy Name of Krishna? The first stage is that it cleanses the mirror of the mind. If the mirror of the mental system is covered with dust, we cannot see things clearly, and scriptural advice cannot be properly reflected there. What are the different kinds of dust covering the mirror of the mind? Our infinite, fleeting, and organised desires are considered dust, and our hearts and minds are covered with layers and layers of this dust. Therefore we cannot see things properly; they cannot properly reflect in our mind because it is covered with the infinite ordinary desires of this mundane world (bhukti-mukti-siddhikami-sakali ‘asanta’). So the first effect of Sri Krishna sankirttana is the cleansing of the mind. The Vedic social system (varnasrama-dharma) has been formed for this purpose. If we discharge our social duties perfectly, without any attraction for the consequences, we achieve purification of our consciousness—but the first installment of nama-sankirttana gives us the end result of varnasrama-dharma: purification of the heart and mind. Then we can understand Vedic advice properly. The next effect of chanting the Holy Name is that it extinguishes the fire of material existence in the forest of repeated birth and death. We are forced to come into creation and again die. The mundane wave catches the souls which mingles with that vibration in different stages. That is stopped by the second effect of Sri Krishna sankirttana, and we become liberated. With the first stride, the intelligence is purified. With the second stride, the Holy Name effects liberation from the great conflagration of threefold miseries. The threefold miseries are adhyatmika: miseries within the body and mind, such as disease and mental anxiety; adhibautika: miseries from our neighbours: man, beasts, insects, and so many other living beings; and adhidaivika: natural catastrophes like famine, flood, and earthquake. We have to suffer from these three kinds of miseries which burn in our heartlike fire. But everything is extinguished forever by the second stride of nama-sankirttana which gives us relief. The next stage is sreyah kairava chandrika-vitaranam: the Holy Name bestows upon us the supreme goal of life. After doing away with these two negative engagements, our positive engagement begins and ultimately takes us to reality, to the real truth, which is eternal, auspicious, and beautiful. It takes to that auspiciousness which is above this world of difficulty, and in a general way we achieve the supreme goal, the highest auspiciousness, the greatest good from chanting the Holy Name of Krishna. If we analyse this scrutinisingly, we find that in this stage, the Holy Name takes us to an intimate personal relationship with Krishna which includes neutrality, servitude, friendship, and filial affection (santa, dasya, sakhya, and vatsalya rasa). Sreya covers the grace of Nityananda Prabhu, for it is by His grace that we may be allowed to worship Radha and Krishna in Vrndavana (nitaiyer karuna habe braje radha krsna pabe). The next stage is anandambudhi-vardhanam. When we come to the proper level while chanting the Name of Krishna, we find the transcendental ocean that is above all sorts of experience. The name comes to assert Himself over us according to the degree of our surrender, and when our surrender is complete, we feel a new type of ecstatic joy; we experience an infinite ocean of joy which is not static, but always dynamic. There we find new life and a new type of blissfulness. It never becomes stale or static, but at every moment gives us a taste of the infinite ocean of ecstasy. The last effect is that our entire existence is purified. This kind of enjoyment does not pollute—it purifies. Enjoyment means exploitation. Mundane enjoyment creates a reaction and pollution attacks the enjoyer, but here, because Krishna is the aggressor, the result is purification. All enjoyment that comes from the centre, from the autocratic desire of Krishna, purifies us completely. In this verse, the words sarvatma-snapanam mean that all different phases of the self which may be conceived are fully satisfied and purified at once by chanting the Holy Name of Krishna. And there is another meaning of sarvatma-snapanam. If we praise Krishna congregationally, we will be purified according to our capacity. Both the singer and the audience as well as anyone who comes in connection with the transcendental sound will be purified. Snapanam means “purifying.” That vibration purifies everyone and everything that comes in touch with it. So Mahaprabhu says, “Go on with sankirttana, the congregational chanting of the Holy Name of Krishna.” Of course, sankirttana must be genuine, so association with saints is necessary. It is not an empirical attempt. We are attempting to have a connection with the higher, unconditioned real which can descend to help us here. We must have that connection with higher reality, for that is all-important. The Holy Name of Krishna is not mere physical sound; it is not lip-deep only, but it has a greater and higher aspect (nama aksara bahiraya bate tabu name kabhu naya). It is all spiritual. We are in the marginal plane of existence, so some higher connection is necessary in order that the wave will descend from that higher realm and come to us and spread its influence outside as well. Wherever it goes, the sankirttana of the Holy Name of Krishna will produce these sevenfold results. This is the purport of Mahaprabhu’s first verse. The first effect is that the Holy Name cleanses the soul which is attacked by the dirt of desires from the mundane world. By the second effect it gives mukti, liberation, perfect independence from material forces. The third effect brings real fortune: the opening of the soul’s treasure. The innate resources of the soul are gradually awakened by the Holy Name of Krishna. Here, Sri Chaitanya Mahaprabhu includes the other forms of relationship with the Personal Absolute. 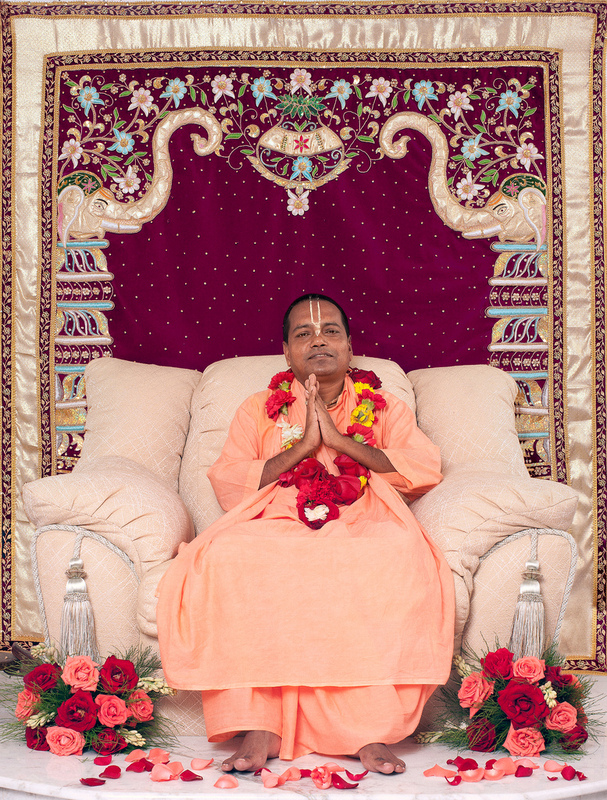 In describing the next step, He takes the mood of conjugal devotion, where one is absolutely disposed for Krishna’s enjoyment, unconditionally surrendering everything for His maximum pleasure. When the sound “Krishna” enters the ear, he feels that transcendental sound awaken in his heart. “What are two ears?” he thinks. “This is the greatest injustice of the creator—I need millions of ears! Then, if I could hear the sweet Name of Krishna, my heart might be a little satisfied. I want millions and millions of ears to hear the sweet Name of Krishna.” This is the temperament of a devotee when his attention is drawn towards the Holy Name. Then he faints; he loses himself, merging in an ocean of ecstasy and joy. And in great disappointment he says, “I failed to understand the quality and quantity of the substance of Krishna’s Name. I am perplexed. What sort of honey sweetness does this name contain?” In this way, the chanter of the name wonders. Krishna's flute. The sound of Krishna's flute has the great mystic power of capturing and pleasing everyone and everything. This has been taught to us by Sri Chaitanya Mahaprabhu, who said, “Properly chant the Holy Name, the sound representation of absolute sweetness.” That sweetness is also to be found in the flute-song of the Lord. The sound of Krishna’s flute has the great mystic power of capturing and pleasing everyone and everything. Upon hearing the sound of Krishna’s flute, the Yamuna’s current is paralyzed. The sweet sound of Krishna’s flute attracts the trees, the birds, and the beasts. Everything is astounded by contacting the sweet vibration from Krishna’s flute. Sound vibration can work miracles; sound has the highest capturing potency. Sound can make or mar. It can do anything; it has such intrinsic capacity. It comes from the subtlemost plane, beyond the ether. That universal sound is absolute sweetness and goodness. How much power is there—how it can capture us! Like a blade of grass, we may be played by the current of that sweet sound in such a way that we cannot even trace out our own personality. We may lose ourselves there, but we do not die; the soul is eternal. Diving, up and down, weare played by the current of the sweet sound. We are less qualified than a straw, a blade of grass, and the Krishna sound is so big and so sweet that it can play us in any way it likes. We cannot begin to conceive how much power is in the Name, the sound which is identical with absolute goodness and sweetness. Sri Chaitanya Mahaprabhu says, “Don’t neglect the sound which is one and the same with Krishna.” Absolute sweetness and goodness everything is there within the Holy Name. And the Holy Name is representing itself to us in a very cheap way: nothing is required to purchase it—not money, no physical energy. All these things are unnecessary. What is required? Sincerity. One who simply takes this divine sound sincerely will be so enriched that no one will be able to conceive of so much goodness and development. And anyone may have it very cheaply, but one must chant sincerely with his whole heart. Of course, wholehearted sincerity presupposes going to a proper agent, a saint, and getting the Holy Name from him. Sri Krishna sankirttana is praised by Sri Chaitanya Mahaprabhu, the inaugurator of the sankirttana movement who came as Radha-Govinda combined. 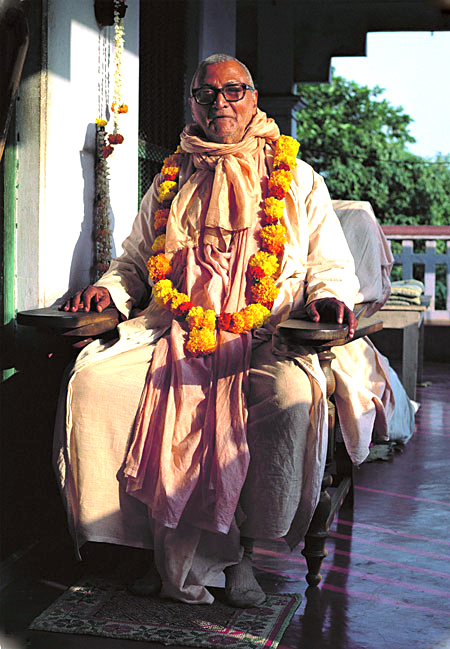 His advice is most valuable and necessary to tell us that with a sincere spirit we must come to join this Sri Kirhsna sankirttana, the most purifying transcendental sound, which effects liberation, gives all fulfillment, and grants us such a positive attainment that we lose ourselves in the ocean of joy and inconceivable sweetness. And in this present degraded age of Kali, only nama-sankirttana can help us. Of course, nama-sankirttana is beneficial in all ages, but it is especially recommended in Kali-yuga, because in this age all other attempts will be opposed by many forces. Nama-sankirttana cannot be opposed by the troubles and waves of this material world, so one must adopt it. If we exclusively give ourselves to this, we will gain the highest fulfillment of life. There is no necessity of any other campaign, for they are all defective and partial. But the most universal, captivating, and beneficial thing is nama-sankirttana, which takes us to the highest goal. That alone can satisfy everyone. Papa means all anomalies, all undesirable things: sin. Material enjoyment and liberation are also included as anomalies, sinful activities. Why is liberation considered sinful? Because it is an abnormal condition; our natural function is to serve Krishna, but we do not do that in salvation. 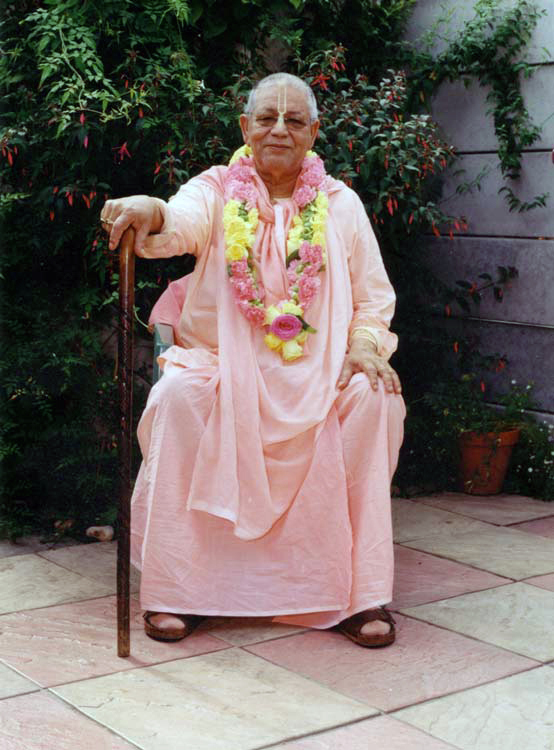 Mere salvation does not include service to Krishna, so that is an abnormal position and therefore it is also a sin. To ignore our natural duty and stand aloof cannot but be sinful. We may consider ourselves fortunate that we have come to the verge of this most generous and useful thought, that we have come close enough to touch it, to accept it, and float ourselves in its waves according to our capacity. After passing through so many conceptions and the charm of different prospects, we have left them all behind and have come to the shore of the ocean of nama-sankirttana. Now we may throw our bodies in this ocean and begin to swim in the waves of nama-sankirttana, the nectar of the nectarine, by the grace of our Guru and the mercy of the Vaishnavas. 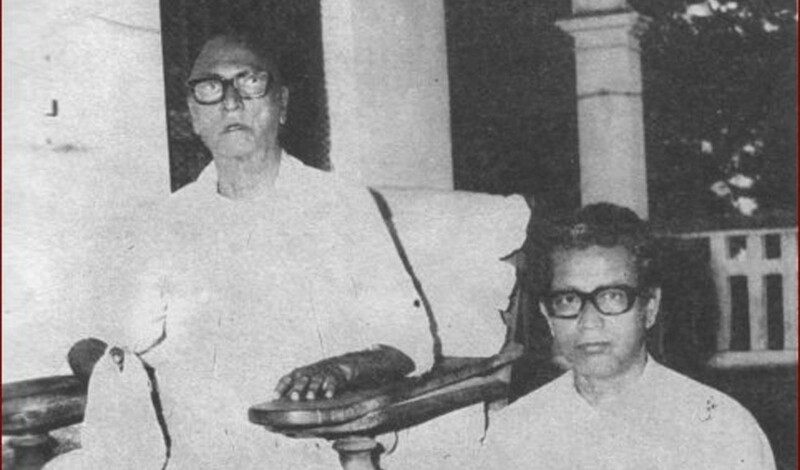 Rupa and Sanatana Goswami. The dearmost associates of Sri Chaitanya Mahaprabhu. It is their property, and we are their slaves. We have such audacity to throw our body into this ocean of nama-sankirttana and swim in that nectarine ocean! Swimming in Radha-kunda, the highest conception of spiritual attainment, can also be found in the highest form of nama-sankirttana. This verse represents the positive side of the unlimited ocean of Sri Krishna sankirttana. The next verse explains the negative possibilities. Bhaktivinoda Thakura has given his Sanskrit commentary on the Siksastakam, as well as his Bengali translation, and his is a most original presentation. Srila Bhaktisiddhanta Saraswati Thakura Prabhupada has also given his commentary on the Siksastakam. They should be carefully studied in order to understand these points more completely. In these talks, however, I am simply coming out with whatever I feel in my heart. Whatever comes to my mind on these verses, I am expressing, and that is the outcome of what I have collected from Srila Bhaktisiddhanta Saraswati Thakura, Bhaktivinoda Thakura, Rupa Goswami, Sanatana Goswami, Sri Chaitanya Mahaprabhu, and all the predecessor acaryyas. By their grace that is gathered in my storehouse, and I am trying to give the gist of these things. When the autumn season appears, the mud within the water vanishes. In the same way, when the Krishna conception enters into one’s heart, all other conceptions and aspirations will gradually have to retire, leaving Krishna in possession of everything. When a real drop of Krishna consciousness enters the heart, all opposing forces must leave and Krishna will conquer and take possession of the whole. That is the nature of Krishna consciousness: nothing can stand in competition with it, not even the so-called devotion for the demigods or faith in creeds like Christianity, Islam, and others. All other conceptions of theism have to retire, leaving the field to the Krishna conception. No aggressors can stand in the fight with Krishna consciousness, the absolute, sweet beauty. Beauty, sweetness, and charm can capture and defeat power. We are really aspiring after beauty and sweetness, mercy, affection, divine love (prema). Self-dissipation-to compensate others with one’s own energy and generosity—ultimately conquers everyone. It is more rewarding to give than to take. Divine love means die to live: not to live for yourself, but to live for others. The most generous form of life—self-forgetfulness to the extreme—is found in Krishna consciousness. Krishna consciousness is so beautiful that one who develops it loses his own identification and existence also. He becomes totally selfforgetful. Such a charm is there. Who will stand to fight against Krishna? Everyone who comes to fight against Him is disarmed. If in any way Krishna enters the heart, there can be no other consequence but that He takes possession of everything. Such a benevolent, generous, and sweet person is Krishna: reality the beautiful.